September 28, 2010 will go down in the history of Krungthep (Bangkok) as the day when the scars from May’s political violence truly began to heal for the Big Mango’s shoppers. It will also go down as a red-letter day in the spreading influence of American fast food and the subsequent spreading of Thai waistlines. 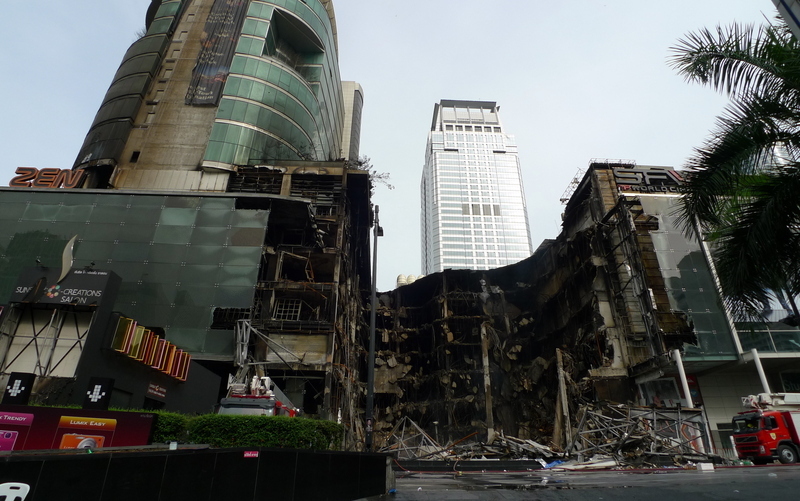 To the first point, Central World Plaza, the largest of the buildings that were badly damaged in the fires set by angry protesters after their leaders surrendered to police on May 19, reopened today. While about 70% of the mall reopened today, the 70% that suffered no damage in the attacks, the remaining portion depicted above is expected to be rebuilt and open next August. The portion opening today includes the Isetan department store, the 15-screen SFX World Cinema, and the grocery store. Can a mall’s reopening indicate political healing? Of course not. That was just a banal attempt to hook your attention as a reader. Under the surface, the issues and power struggles remain, yet to be resolved. 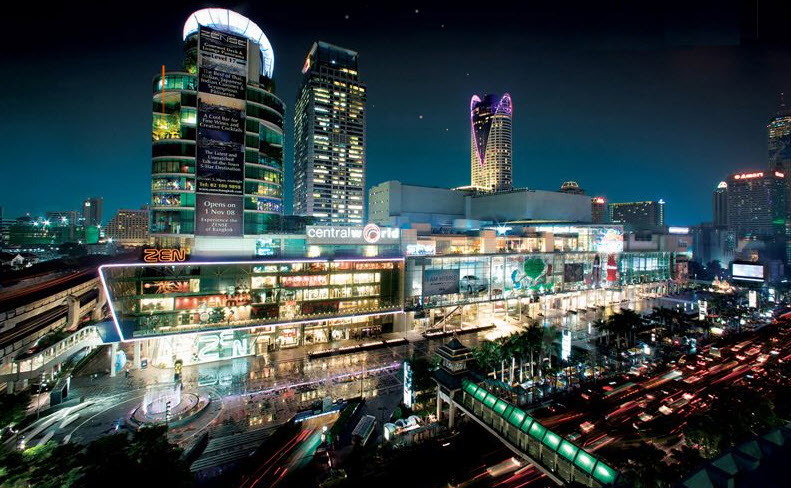 But for those of us who live here, whose lives were disrupted by the political events of April and May, the opening of Central World Plaza is another sign of life getting back to normal. In other news – and possibly an attempt to draw away some attention from Central World’s reopening – the first Krispy Kreme doughnut franchise in Thailand opened today at the Siam Paragon mall, just down the street from Central World. Doughnuts have been popular in Thailand for at least a few years, as evidenced by countless Dunkin’ Donut and Mister Donut outlets. Last year, a Malaysian chain called Daddy Donut entered the market and they even have a mobile donut truck that sets up in different locations to sell donuts to hapless passersby. Nonetheless, there is no lack of hoopla surrounding the opening of this first Thai Krispy Kreme. If you want my opinion, I think the fad won’t last. The Hong Kong locations of Krispy Kreme only lasted a few years before they closed and I don’t think the Bangkok crowd, which is quite fickle with its fads, will turn Krispy Kreme into an overwhelming success. The big question is this: What’s the big deal? Thai culture has so many fantastic desserts and snacks and they are inexpensive, readily at hand, and perhaps slightly healthier than a doughnut. As I notice the Thai high school and university students in their uniforms, bigger, taller, and heftier than their counterparts were even a half-decade ago, starting to approach the bodily proportions of their peers in the American Midwest, I can’t help but wish the influence of Western style fast food chains would wane. So here’s to progress, as it were. A reopened mall and a new fast food shop. Bangkok, you’ve come a long way. This entry was posted in Uncategorized and tagged Bangkok, Central World, culture, Donuts, Fast Food, food, Krispy Kreme, Krungthep, politics, Snacks, Thailand by christao408. Bookmark the permalink. Hope it’s better than ever before!Donuts are bad. I like the krispy kream donuts but not so much any other kind. I am not a fan of donuts.I was just thinking the other day about whether or not it’s safe to travel to Thailand now, since a group of my friends will be there during new years. Why don’t they open Krispy kream stores in Mainland, china? I think most young people would like them. It’s a big market! My close friend has Starbucks coffee every single day in Beijing. sigh…I can’t do it in Canada. The Store next door to me sells Krispy Kream donuts. I need to avoid them but give in once in awhile for coffee and a donut. The ones in Toronto didn’t last very long either! @Wangium – Jason, it is perfectly safe and even during the protests, the country as a whole was safe for visitors. If your friends have any questions, feel free to put them in touch with me. @brooklyn2028 – Oh, really? Didn’t realize they had come and gone there. But, then, that’s no surprise. Tim Hortons all the way! @beowulf222 – Wow, Nick, I never would have pegged you for a KK fan. I guess I know what to bring you on my next trip to Singapore. 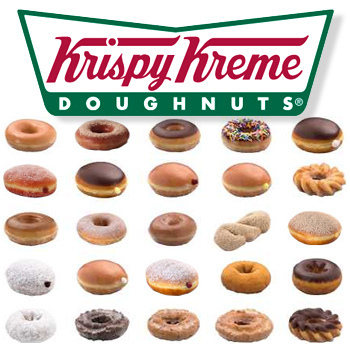 @foggysunnymorning – I bet the folks at Krispy Kreme headquarters have their eyes on China. @nov_way – I’m with you on cookies over donuts. @Fatcat723 – @NightlyDreams – Yes, I’m not opposed to an occasional donut and the ones fresh out of the oil are pretty tasty, but I just don’t see them as that special a treat. @yang1815 – I have no doubt the mall did a lot of sprucing up to entice customers back. Most everyone I know is very excited for its reopening as it never seems as crazy crowded as the Siam Paragon mall down the street, which is a madhouse on weekends. I am glad the mall is reopening. You wonder why the desire to have donuts and other western foods there, when Thai desserts are so inexpensive and so much more delicious.. It is the sound of the distant drums and the fact that the grass is greener on the other side of the fence. Look at India. It has all the fast food chains there. The public loves it. It wants to emulate and give in to a western societal food fad. It is sad but that’s the fact. Yeah I don’t think the KCD will last too long. They didn’t do well here either.. so they have to go and market themsleves elsewhere. Where there are donuts, there are cops. Does the spread of donut franchises in Bangkok signal a coming police state? @christao408 – It is unfortunate that they do that Chris. All the fashions, the cars, the way of talking big, despite the criticsm of the United States, all point to being enamoured by the capitalistic attitude of the West. Every child in India would like to go to the States, 80% of the families want one or more of their kids to move to US. It is unhealthy, and so racist in reverse order, but yet it is true. Then they come here and complain about this government. It’s just the way of life with some people. krispy kreme entered the indonesian market a few years back. it was a big thing when it first opened but now it has lost its initial followers to the other doughnut brands that’s been opening since then. people here are looking for varieties and krispy kreme can’t deliver that. dunkin’ doughnut still is the top seller here. @rudyhou – Considering that Mister Donut sells “sushi donuts” – donuts that look like sushi, kind of – I don’t think KK will be able to meet market demands here, either. @AppsScraps – Interesting. I figure if someone wants a good donut in Canada (or parts of the US) they should just go to Tim Hortons.